After several devastating storms this winter, Pacifica leaders and residents are welcoming some much needed help. State and federal funds will soon be pouring in to help repair and study the erosion along the city's coastal cliffs. 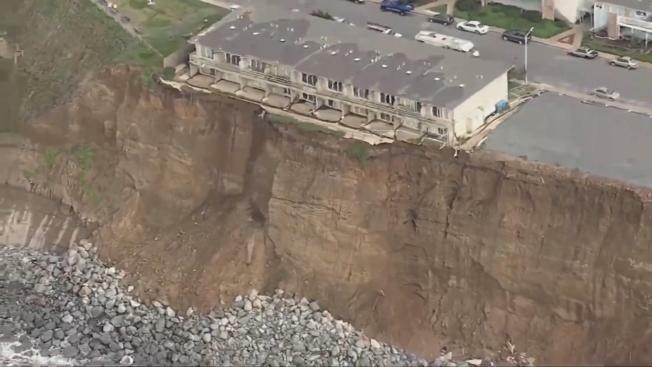 Along Esplanade Avenue, where two apartment buildings have been demolished and a third is scheduled to be taken down soon, the Army Corps of Engineers will begin formally studying the cliff below, according to U.S. Rep. Jackie Speier. The goal of the study, she said, will focus on identifying solutions that would protect infrastructure beneath the road and homes along the cliff. "This is a story of the federal, state, and local governments rolling up their sleeves and working together for long term solutions," Speier said. "This is government working." But, she added, "Even if the seawall is repaired, Mother Nature will continue to challenge this beautiful coastal town." Elsewhere on Wednesday, city workers repaired a fence damaged by waves last weekend at the boardwalk on Beach Boulevard, which continues to be one of the hardest hit areas during periods of so-called king tides. The total estimated cost for the 12 damaged sites in the city is estimated at $3.6 million. City and state leaders announced that Pacifica will pay for the damage with $1 million of state disaster assistance, $2 million from insurance coverage and the remainder with city funds. While lawmakers applaud the government collaboration, some neighbors who live along Beach Boulevard fear the erosion will move faster than the repair projects. "What I'm asking for is the city reinforce that wall at the very least so we can get through the next 2-3 years," homeowner Mike Bell said. The building on Esplanade is privately owned, but the city is footing the bill for its demolition because the owner has failed to do so. There is no timeline for when it will be taken down.